click image for close-up This engraving from the April 30, 1853 edition of the Illustrated News shows the congregation of Cincinnati's African Church. 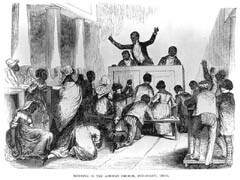 The churchgoers are kneeling or have their arms raised in prayer, while a man with outstretched arms stands before them at the podium. Although located in a free state, Cincinnati was located just across the river from slave-holding Kentucky, making it a popular location for both free and fugitive blacks. Between 1820 and 1829, Cincinnati's black population grew from 2 percent to nearly 10 percent of the ciy's population. The city's Overseers of the Poor responded to this growth by enforcing the state's "black laws" which required blacks to register with the county clerk to ensure that they were not fugitives and to obtain a certificate to work. Blacks in the city were given 30 days to comply or leave the state. White mobs forced more than a thousand blacks to leave the city, prompting the organization of the National Black Convention movement, which met for the first time in Richard Allen's Bethel AME Church in Philadelphia in 1830. By the 1850s, when the Illustrated News published this image of the African Church, increasing numbers of blacks from Pennsylvania had begun migrating to Cincinnati.